The importance of prevention of ill-health and promotion of wellbeing needs to be high on the agenda of governments and health systems. Rechel (2014) make the point that a very low proportion of health spending is on prevention. 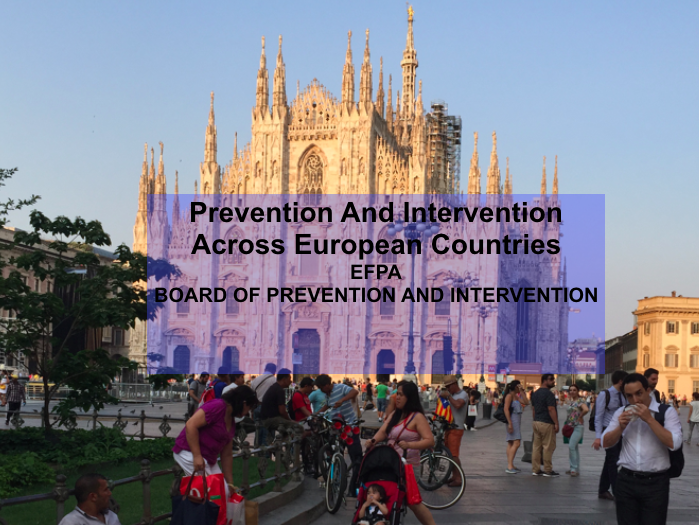 Psychologists have a key role to play in this field and this symposium will provide an overview of the work of the newly formed EFPA Board of Prevention and Intervention (http://preventionintervention.efpa.eu/introduction/ ). The symposium presents areas of work with children and young people: one of an intervention at an institutional level in orphanages; another study on the use of EMDR and the framework of Adverse Childhood Experiences (http://www.cdc.gov/violenceprevention/acestudy/) ; and on suicide prevention among young people in Europe. We will close the symposium with a presentation of the results of a survey across member associations concerning the work that is done in prevention. Rechel, B. (2014). Facets of public health in Europe. Milton Keynes: Open Univ. Press. The work of the EFPA Board of Prevention and Intervention. Over the past two years the EFPA Board of Prevention and Intervention has been working to develop a framework for collaborative working to promote this area of psychological practice. The presentation will outline the main focus of the group’s work, the goals it has set and the obstacles to their achievement. It will also invite participants to join with the group’s work in developing a European network of applied psychologists working in prevention. Prevention of the Social Orphanhood: St. Petersburg Baby Home Intervention Project Results and New Policy on Institutions for Children Left Without Parental Care. This presentation is focused to describe the quasi-experimental institutional intervention project designed to support caregiver-child interactions and relationships in three institutions for children birth to 4 years, called Baby Homes, in St. Petersburg, RF. The results of the project influenced the new Resolution of the RF Government concerning institutional care, ultimately requirements for creating in institutions a family environment for orphan children. The attention of scientific research in recent years has been focused on the link between a history of traumatic life events and the onset of psychological and medical disease in adulthood. The aim of the presentation is to explain the concept of Adverse Childhood Experiences (ACE) and to explore its usefulness in planning prevention and the role of EMDR therapy as one of the intervention programs. Suicide prevention is as complex as the phenomenon of suicide. Targeting young people we aim to influence their developmental processes in order to increase their well-being and prevent suicide not only in this developmental phase, but also later in life. Interventions include awareness programmes, education of gatekeepers, screening, as well as changes of attitudes in society. This presentation aims to give a brief overview of gathered information concerning member associations and their involvement with this branch of practice. The data comes from answers to an informal questionnaire: What are the main challenges when it comes to mental health and quality of life issues in some European countries, and what can be done to prevent and intervene at different levels. This presentation is supplemented by data from World Health Organisation and Organisation for Economic Co-operation and Development overviews. It will be discussed in terms of what kind of skills and competence psychologists need to build, in order to participate in evidence-based prevention and intervention at a community level.